Is it time for you to start searching for your next truck? Are you unsure of where to begin looking? If you live in or near the Indianapolis, Indiana area, Acra Automotive Group is the only used car dealerships you need. Acra Automotive Group has a friendly and knowledgeable sales team as well as an incredible inventory selection of used trucks for sale, and we are only a short drive from many major Central Indiana Indiana cities. So, we are ready to help you find the truck of your dreams at our Columbus, Greensburg, and Shelbyville IN used car dealerships. We have many makes, models and body styles of used trucks for sale. You will find everything from a used Chevy Silverado truck to a used Toyota Tacoma truck. Used 4x4 trucks, used diesel trucks, and many other types of used trucks for sale are available at Acra Automotive Group. You will also find a selection of cheap trucks for sale. With such a great selection of used trucks in our inventory, we are confident that you will find something that will meet your needs. Are you looking for a used truck for sale that offers a lot of power, is eye-appealing, and is loaded with amenities? Then you should check out the 2008 Chevrolet Silverado 2500HD LTZ used truck for sale. This beast of a truck has a powerful 6.6-liter 8 cylinder diesel engine that boasts an incredible 365 horsepower. Diesel engines are known for having better reliability, better longevity, better fuel economy, and higher towing capacity. 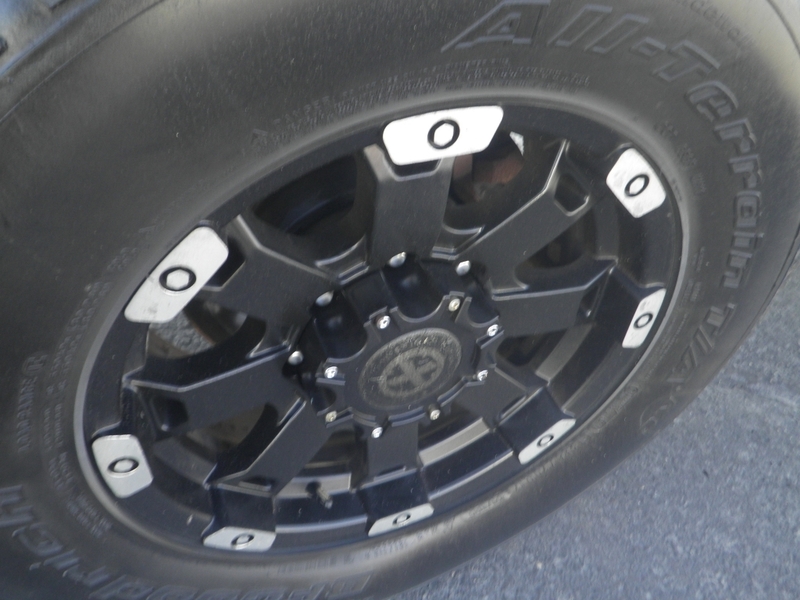 This used Chevy also has customized features such as black and chrome rims that really make this truck stand out! This used Chevy truck is loaded with all kinds of desirable features. Some of these features include a remote engine start, voice command features, leather seats, and navigation. Remote engine start is a great amenity to have with all of the different seasons in Northern Indiana. Voice command features allow you to make and receive phone calls, change radio stations and volume, and much more. Leather seats are classy as well as functional. They look great, and if a minor spill happens, it can be easily cleaned up. With a built-in navigation system, never worry about going over precious data on your cell phone because of using your phone's navigation to get where you are going. This used Chevy truck also comes with a rear entertainment DVD player. Now going on long road trips with family and friends will be a lot more peaceful. Stop in today and take this used Chevy Silverado 2500HD truck for sale out for a test drive to see if it is the one for you today. 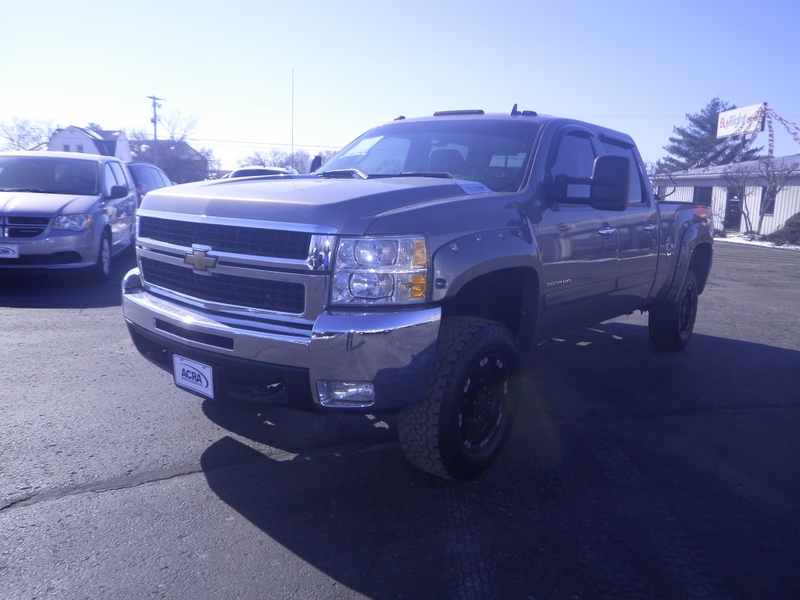 If this used Chevy truck for sale is not what you are looking for, come and see one of the many other used trucks for sale at Acra Automotive Group. All of our used trucks are carefully inspected, so no matter which one you choose, you will be proud to call it your own. Once you find the used truck for sale that will fit your needs best, be sure to take it out for a short test drive. This is to make sure it is the right one for you. Drivers all over Columbus, Greensburg, and Shelbyville IN love our used trucks. You can too when you make the drive from the surrounding Central Indiana towns. If you keep a tight schedule and need to do your research online first, our easy to navigate website will be just what you need. You can sort the Acra Automotive Group inventory by make, model, price, or even body style. You can also enter your current vehicle's information. This is so you can get an estimate on your trade-in. To get a quote, select “Trade-In Appraisal” at the bottom of any page and start entering in your vehicle’s information. Are curious about financing? Fill out a secure online credit application by selecting “Financing” on to the top or bottom of any page that you are on. Let us show you how easy buying a used Chevy truck can be at Acra Automotive Group. We strive to develop long-term relationships with our customers at Acra Automotive Group. We are here for you every step of the way. From finding your next truck to financing. We do our best to get you back on the road quickly in your next truck. Find out why we are the only Columbus, Greensburg, and Shelbyville, Indiana used car dealerships you need to go to find your next truck. Give us a call today to schedule an appointment for a test drive. Whether it is a used Chevy truck that you are interested in or another one of our used truck for sale, we have the perfect one for you at Acra Automotive Group. Enjoy a stress-free environment when you come to our Columbus, Greensburg, and Shelbyville, Indiana used car dealerships in search of your next truck. We are happy to provide a great selection of used trucks for sale in Central Indiana, incredible deals, and outstanding customer service. Here are the locations for each of our Acra Automotive Group dealerships: Contact Acra Chrysler Dodge Ram Jeep at 888-604-2722 or come to 1407 North Lincoln Street in Greensburg, Indiana 47240. You can contact the Acra Pre-Owned Superstore in Columbus at 888-356-2272 or visit us at 2820 North National Road, Columbus, Indiana 47201. Acra BuyRite Auto can be reached by calling 877-925-2272 or visit us at 920 North Michigan Avenue, Greensburg, Indiana 47240. Our Shelbyville used car dealership is an Acra Pre-Owned SuperStore and can be reached at 888-318-2272. Or, feel free to stop in at 1200 East State Road 44, Shelbyville, Indiana 46176.